Summer cooking is easy. At most, you need to apply heat and a little salt to fresh ripe ingredients (think corn, zucchini, or greens). If it's too hot, you just slice a tomato and some bread, or eat half a watermelon with a fork while you watch tv in an air conditioned room. You make a meal of salad (with half a bottle of rosé), or invite some friends over to cook a mixed grill. Dessert in the summer should be easy too—ice cream from the Mr. Softee truck, a bowl of fresh berries and whipped cream, maybe slab pie or cobbler if you're ambitious and the kitchen is cool enough one evening. Are you in charge of bringing dessert to the potluck? 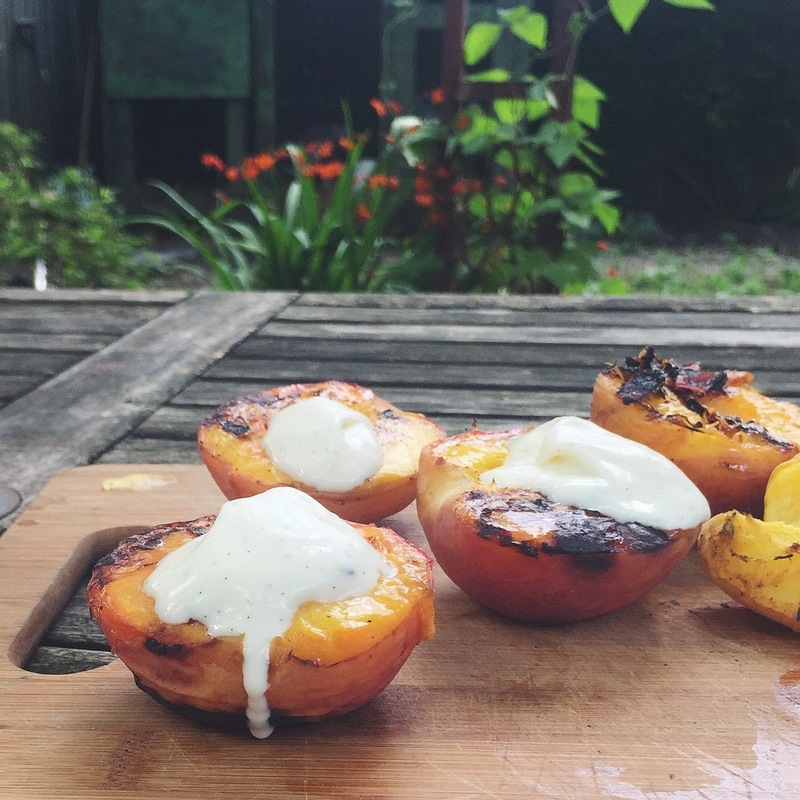 Here is one that will wow, effortlessly: grilled peaches with vanilla mascarpone. Scrape the vanilla bean into the mascarpone cheese. Stir in sugar so the mascarpone tastes barely sweet. Now pack that up alongside a bag of peaches (at least a half per person) and take it to the cookout. After the steaks and corn and everything else have sizzled and charred, slice the peaches in half and place them face-down on the grill. Cook them until they are marked by the gill and the edges caramelize. Then flip them just long enough to warm the other side. Transfer the peaches to a platter, face-up. Dollop a spoonful of vanilla mascarpone onto each—and dive in.